Long-time readers of this space know I have an obsession with alliums: onions, garlic leeks and such. Every spring I harvest huge numbers of our local wild onion, the tri-cornered leek. Mostly I use them as a substitute for garden variety green onions or scallions. Here with scallion pancakes, the onion is the star, the main flavoring and textural element. It is a fantastic way to celebrate the ephemeral bonanza of spring. 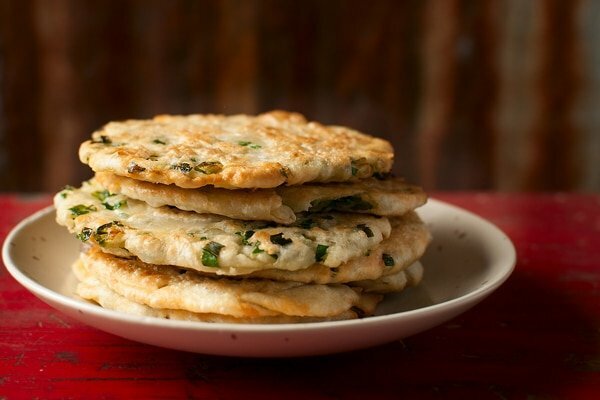 Chinese scallion pancakes are, as you might be able to tell from the picture, not really pancakes. They’re flatbreads. Really, really good flatbreads. I’d never eaten them before I first made this recipe, almost a decade ago, but they’ve become a spring tradition at our house. Eating one is not really like eating bread. Yes, they are kinda-sorta bready, but these pancakes are chewier, you get a little juicy crunch from the onions. and the aroma of sesame oil and onion is so wonderful it’ll make your eyes roll back in your head. Like my venison potstickers, this is one of those “Oops! I ate them all. Again.” kind of foods. roll them out with a pin. How to eat them? By themselves they are great, but they become sublime with a sweet-spicy dipping sauce. Think Sriracha with a spoonful of honey in it. 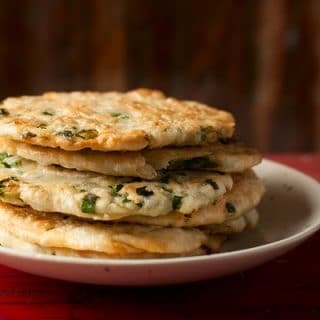 Scallion pancakes are also good cold as a trail snack, or something to bring to work or on a long drive. Making these pancakes requires a little bit of skill, but I will walk you through step by step below. Any sort of green onion will work, from regular green onions to chives, garlic chives, ramps or any wild onion. 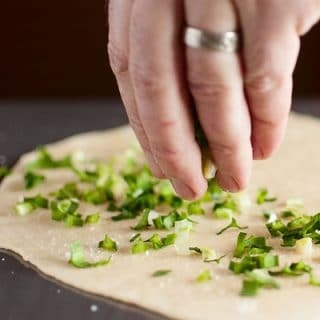 I use tri-cornered leeks here.It also really helps to have a tortilla press to quickly flatten the pancakes, but you can certainly use a normal rolling pin.These are best served warm, but are almost as good at room temperature. Put the flour in a large bowl and make a well in the center. Bring the water to a boil, then turn off the heat. When the water stops bubbling, pour it into the well in the flour. Stir together with a fork until you get a shaggy mass. Wipe the goopy flour off the fork and knead the mass into an elastic dough, which should take about 3 to 5 minutes. Put the dough into a plastic bag or wrap it in plastic wrap and let the dough sit for 30 minutes. Take the dough out and cut it into four pieces. Put three of them back into the plastic bag. For a work surface, I use a baking sheet flipped over that I've lightly oiled with vegetable oil. Roll out the piece of dough into a roughly rectangular shape; it doesn't need to be precise. Paint the dough with the sesame oil, then sprinkle with about a half teaspoon of salt. 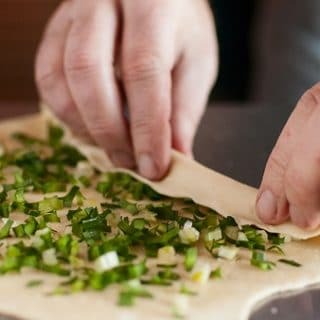 Sprinkle chopped scallions over the dough generously, leaving about 1/2 inch free space on all sides of the dough. Roll the dough into a tight log starting from the longer side of the rectangle. Slice the log in half and pinch close the ends of the log to keep the scallions from spilling out. Take one half of the log and roll it tightly into a snail. Flatten the snail with the palm of your hand. Cut up a Ziploc bag or somesuch into large plastic squares that will cover your tortilla press. Place the flattened snail on one piece of plastic, cover it with another. 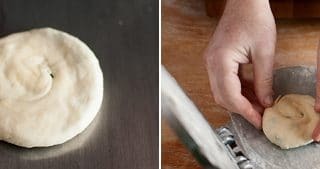 Squash the dough with the tortilla press, or roll it out with a rolling pin to a thickness of 1/8 to 1/4 quarter of an inch. Now you need to fry the pancakes in a little hot oil. I fry and press as I go, keeping the finished pancakes in a tortilla warmer lined with paper towels. You could also put them on a baking sheet in an oven set to 200°F. But if you are a beginner, roll out all your pancakes first. I fry the pancakes in a large saute pan with about a tablespoon of vegetable oil. I prefer peanut oil because it's used a lot in Chinese cooking. Lard is another good choice. Get the oil hot before you drop the pancake in and cook for about 2 minutes per side, just until you get a little browning on them. Serve by themselves, with soy sauce or with a sweet-spicy dipping sauce. Scallion pancakes will keep in the fridge, wrapped in a paper towel, for a day or two in the fridge. 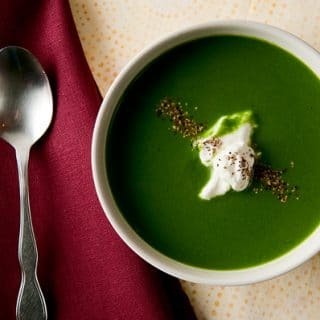 You can find all sorts of recipes for wild onions and other wild greens right here on Hunter Angler Gardener Cook! How about the recipe for the Venison pot sticker! A perfect compliment to this..